Did it ever occur to you who maintains the trails we walk on and so easily take for granted? Most of us might think that it is done by state and federal employees of the different park and forest services in MD, PA, VA and WV. The truth is that the budget they have to work with would not allow them to sustain the wonderful trail systems that we have at our disposal. The reality of the situation is that it is mostly done by volunteer organizations .... for free! There are many of these organizations, all doing more than their share of the work. To try to develop a system for reporting trail issues to all of them would be an impossible task. There are two great trail maintenance organizations in our region: The Potomac Appalachian Trail Club (PATC) and the Keystone Trail Association (KTA). The PATC is a 7000-member volunteer organization, headquartered in Vienna, Virginia. 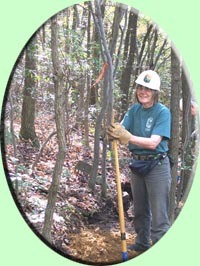 The club, founded in 1927, is responsible for the maintenance of 240 miles of the Appalachian Trail, as well as approximately 800 miles of other trails in the Mid-Atlantic region At the current time they have no easily accessible infrastructure to accommodate easy reporting of trail blockages. Jim Tomlin, a PATC District Manager for the Great North Mountain region of the George Washington National Forest/Lee Ranger District, has volunteered to be the central hub for receiving and disseminating information about trail conditions to other PATC District Managers who will then pass it on to the individual trail overseers. How can you help get this information to them? While hiking carry a note pad and pen or pencil. Keep it handy but in a dry place. As you encounter blockages or hazards on the trail jot down the necessary information (see below). Upon your return fill out the form found on the link at the bottom of this section. Click the "SUBMIT" button and the data will go directly to Jim. George Washington National Forest (GWNF)/Lee Ranger District: Massanutten Mt and Great North Mt. Trails within Michaux State Forest that connect with the AT including those found in Caledonia and Pine Grove Furnace State parks. A more exhaustive list of trails will be linked to this page in the future. Note: The following form is only for trails maintained by the PATC!!! Report all other trail damage to the appropriate authorities. Fill in the Name (confidential), E-mail (confidential), Forest/Park/Other Location and Date fields. There is room for 10 entries. If you have an extensive report with multiple entries for a given trail and are reporting on multiple trails you can place all entries for a given trail in one description box. Number and describe each separate trail hazard. Create a space between each entry. Fill in the Trail Name box. 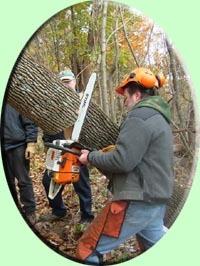 Type of hazard : fallen tree blocking the trail, dead/alive with or without leaves, single or multiple limbs/trunks, maximum diameter of largest trunk/branch at trail’s edge, Trail overgrown with thorns or stinging nettles, etc., serious trail erosion or blowouts near waterways, damaged or missing signs and bridges. Approximate Location: Approximate distance and direction from closest trailhead, trail junction, road, identifiable waterway or other fixed landmark. Important: If a trail or trail segment was hiked and is "clear" report that as well. It will make the Trail Overseer's job easier. Visit the following links to see and learn more about the work of the PATC. Please take a few minutes on the trail and then at your PC to help these two organizations more easily maintain the trails we use to experience nature.